NASB 12 For the word of God is living and active and sharper than any two-edged sword, and piercing as far as the division of soul and spirit, of both joints and marrow, and able to judge the thoughts and intentions of the heart. I like the Greek word for sharper in both translations. The transliteration of the Greek word gives the specific meaning of “one cutting motion with pristine accuracy.” The opposite Greek word means to “use a repetitive motion to perform the cut.” God reminded me of my frozen sausage I sometimes cook for breakfast. I buy the logs of sausage that are normally refrigerated in a tubular plastic wrap. When you freeze them, slicing a serving requires a “SHARP” knife to cut through the frozen meat. Most knives require a consistent, hacking away on the frozen meat to gradually slice a piece. But I have one knife that is EXTREMELY SHARP that will accurately cut one slice at a time with a SINGLE motion. This is the sharpness the Bible has on our hearts and minds when consumed/shared rightly-divided. NASB 15 Be diligent to present yourself approved to God as a workman who does not need to be ashamed, accurately handling the word of truth. The Greek word for “rightly dividing” helps us arrive at the “precise” meaning of the Pauline instruction to prepare yourself to manage the Word “accurately handling it or dissecting/expounding the Word correctly.” This preparation will improve your life and the lives of others as you share. Are you willing to study to be prepared? The opportunity is available now and it is totally free! The time is now! Take every step necessary to be on the Spiritual winning side of the ongoing warfare manifesting throughout this world. My grandmother was a woman of faith. She stood for Christian principles and if you knew her in any way you were in the presence of victorious Christian living. I learned many lessons of faith, hope, determination to follow God, standing on the promises of God’s word and “being more than a conqueror” that I realize from week to week. Her daughter, my mom, continues to be a beacon of light into these lessons and His word by continuing to stand for the truth. We all have access to truth when we read the Bible. Who was the first person who read the Bible to you? Did they have you to read the passage or did they read it? Can you remember what passage it was? I started out doing video blogs. There’s a link to that google site. A particular video blog there was the first difficult experience I encountered posting. There were numerous problems I had to work through to get it accessible. Amazingly, the more difficult it became the more determined I was to get it done. And to God be the glory it IS posted – “PRAYER CHANGES THINGS”. When you are faced with difficulty what is your immediate response? I know that “letting go and letting God” is not always a first response. Trial and error is sometimes necessary to arrive at the place where you know your are in need for Heavenly intervention. You can get so animated that you just “look up”. Prayer is not a hardship but I know what it feels like when it is. The causes of my unwillingness to pray are rooted in my human nature. There is a constant warfare present in all of us that is between doing it my way and doing it God’s way. Romans 7 is written to address this dilemma. I have found out that a synergy between the two wills – soul and spirit – is possible only when the Holy Spirit is actively in control. I give Him that control when I pray, when I read the Bible, when I meditate on Scripture, when I sing hymns, Psalms and good gospel music and when I fellowship with other children of God. When these activities are not present I am left with all of the appeal of the world as a poor substitute. So I have a responsibility to CHOOSE which way I will direct my thoughts and actions from day to day. Being More Than a Conqueror becomes your identity when you choose God’s way and not the way of the world which is natural. There is a song for Psalms 121. The first time I heard this song I was singing in the choir of my church home here in Georgia. Miss Carol sang the song so beautifully and I was absorbed by the spirit of the song as I was learning it in rehearsal. At that time in my life I was transitioning from my home state of New Jersey to Georgia. It was a tumultuous time in that I was separated from my wife and children for what I thought would be indefinite. This was a valley experience and there were steep hills and mountains all around me. I was overwhelmed with the devastation of the situations that led up to our separation. Dealing with failure, powerlessness and unmanageability honestly for the first time in my life, this was the beginning of the tearing down of some major strongholds in my life during the end of 2000. I had to get real with God about the issues that were destroying the goodness that He provided in my life. I would go to church every Sunday and the more I showed up the more I heard The Spoken Word of God. My sin-sick soul needed to get the willingness to let that Word penetrate from my head to my heart. It took the repetition of being around the Word of God during those months in order for it to become alive and at work in me. These were painful times but they were Heavenly times. The song presented me with the truth of the source of my help. It gave me the confirmation that all along my journey to get to that place of healing, the Lord was my keeper, the Lord was my shade upon my right hand. He was preserving my soul even forever more. MY HELP, MY HELP, MY HELP COMES FROM THE LORD. At that time I needed help to get up and walk by faith and not by sight. Life had beat me down to where I was not walking spiritually. I was crawling because of the affects of manifest sin at work in me. When you do not stay in fellowship with El Elyon – The Most High God — The Possessor of Everything Heavenly and Earthly – by way of His Word, you are destined to live in sin. Over time, if you are His child, that lifestyle makes you have to yield to Him. In those moments of initial ascent towards Him you will be met with God’s Help. He desires to help his children always. (Click the underline) The issue becomes this – YOU CAN NOT TELL HELP HOW TO HELP!!!!!!! Being more than a conqueror means having the acceptance that God is God all by Himself. He does not need you to guide Him; YOU NEED HIM TO GUIDE YOU!! He makes it possible for you to realize just how proficient He is at leading when you begin to abide in Him by staying in His Word and allowing His Life to affect EVERY aspect of your life. 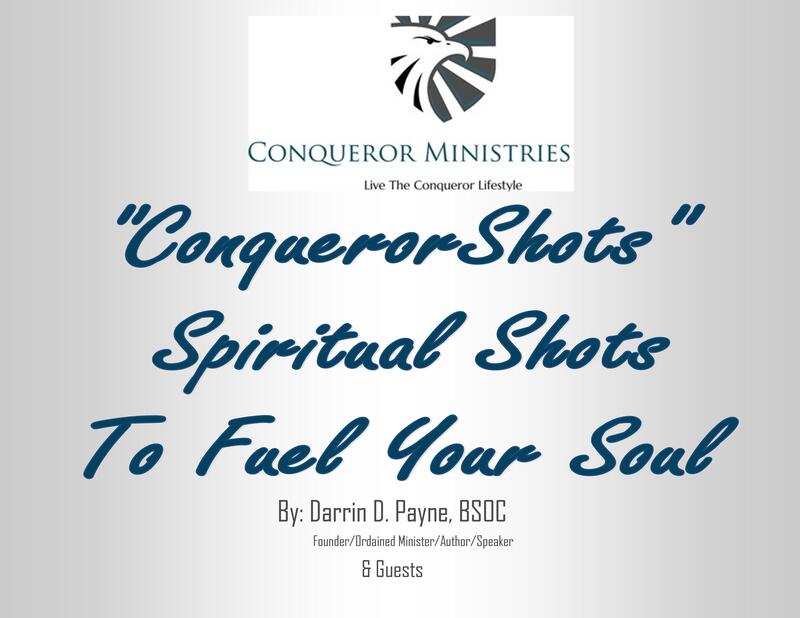 This is how you live as “MORE THAN A CONQUEROR”. This song ministers to my spirit the message of God’s Determined Will at taking care of His children. Though it was addressed to the Nation of Israel, the principles of God depicted in this chapter are applicable to us today as Christians since we are ALL God’s children today because of the Blood of Jesus.